A note to my dear readers: I haven’t missed a single week of posting in over two years, but it’s finally happening — I will be taking the next two weeks off. I’ll be back on Thursday, June 12th! (And if you’re wondering why: One week from today, I give a talk about my dissertation, then fly to Wisconsin for my sister’s wedding. The following week, I fly back to CA to defend my dissertation. Wish me luck!) I’ll miss you while I’m away! Remember back when I wrote about how sauteed kimchi is like the gateway drug to raw (fermented) kimchi? Well I’m giving you one more recipe that uses cooked kimchi to really win over anyone who still has any doubts. That’s how passionate I am about the combination of kimchi + heat. 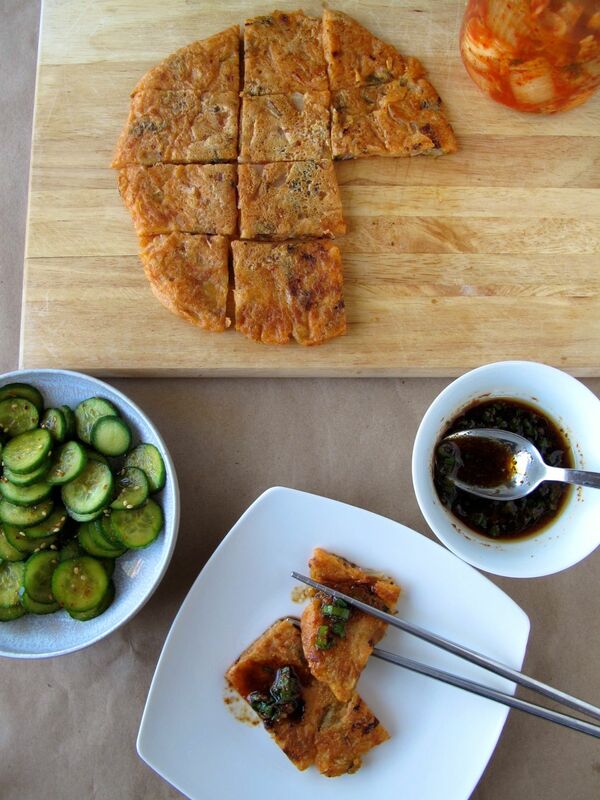 Kimchijeon is a crispy, savory pancake, packed with tangy kimchi. This has happened to me more and more recently as I’ve gotten toward the end of my PhD program (with less and less energy to cook). Just two more weeks and I can get back to some high maintenance, multiple-ingredient cooking again! 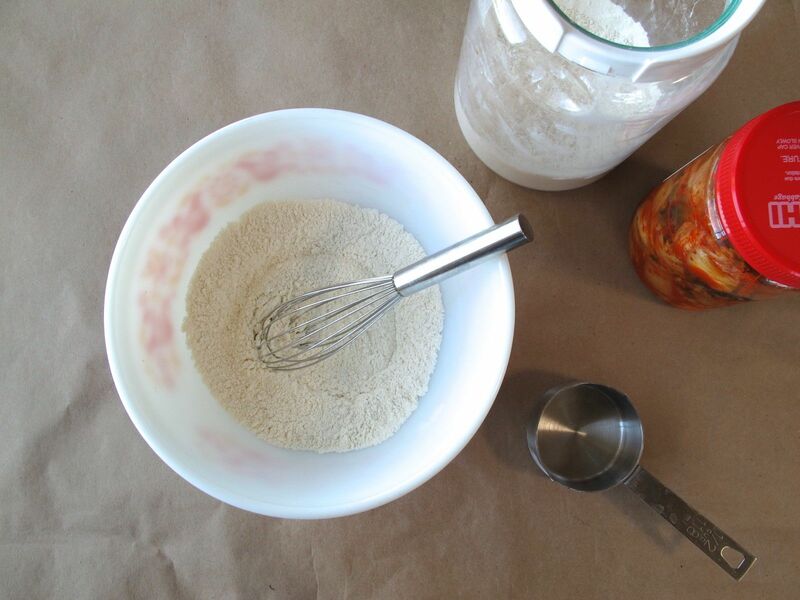 You’ll want the batter to seem quite thin and liquidy — like it’s really mostly the diced kimchi with just a little batter around it — that’s okay; it will all come together into a pancake. It still might require a little experimenting with different size pans, though. If you’re using a pan that’s too small and you can’t spread the batter out thinly, then the pancake will be puffy and the middle won’t get cooked enough: better to spread the batter thin, and make a second mini pancake, rather than one big one that’s too puffy. 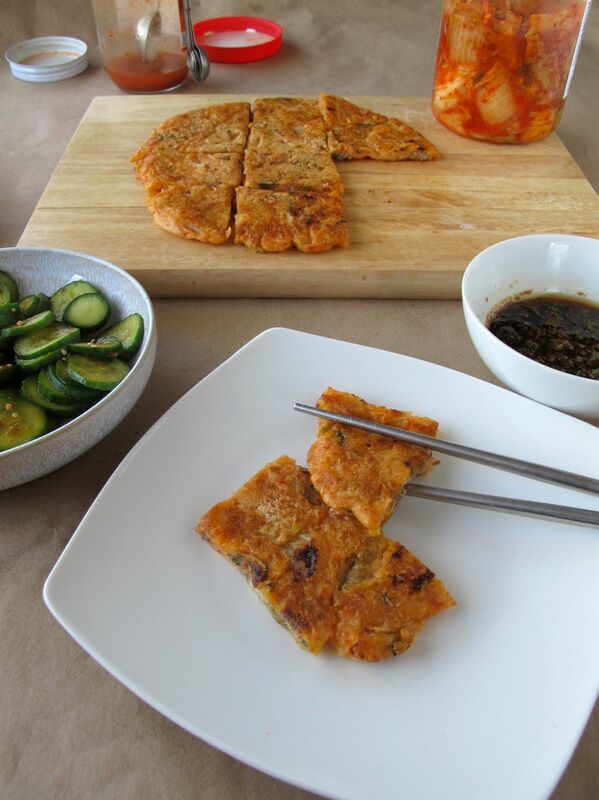 Other types of Korean jeon (like pajeon, made with scallions) are often eaten with a vinegary dipping sauce, laced with garlic and crushed red chili pepper. Kimchijeon is so flavorful, it doesn’t really need a dipping sauce, but it fancies things up a little, and adds an extra kick of garlic and heat to a dish that’s already delicious but not actually that spicy. 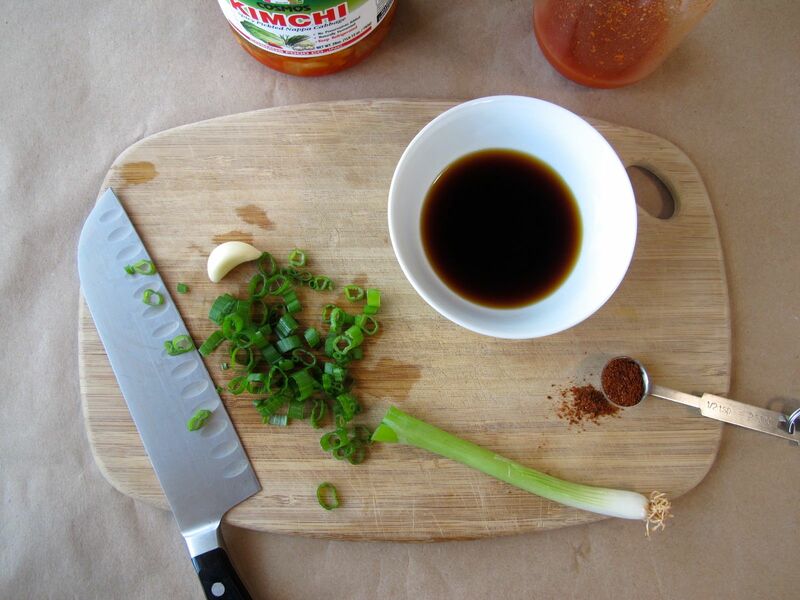 I’m including the dipping sauce that I like to make for jeon here. Just in case you want to take your single-pan, under-30-minute, kimchi+flour+water, appetizer-for-dinner experience up a notch. Active and Total time: 25 minutes. 1. 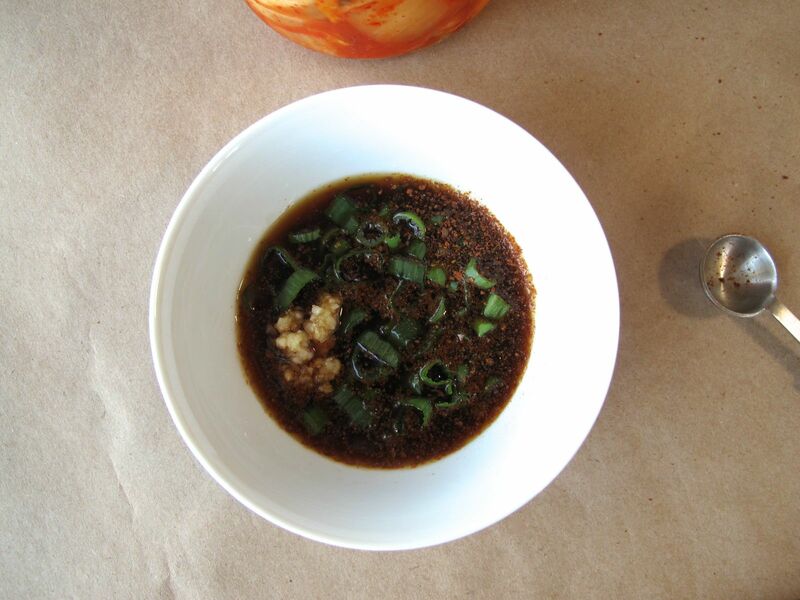 Mix together all dipping sauce ingredients in a small bowl and set aside. 2. Pre-heat the vegetable oil in the pan on very low heat for 7-10 minutes (to make sure the pan is evenly heated), then turn it up to medium heat for another 3-4 minutes. 3. Meanwhile, dice the kimchi (if you don’t want your hands to get spicy, use a plastic ziploc bag over your hand as you hold the kimchi in place). 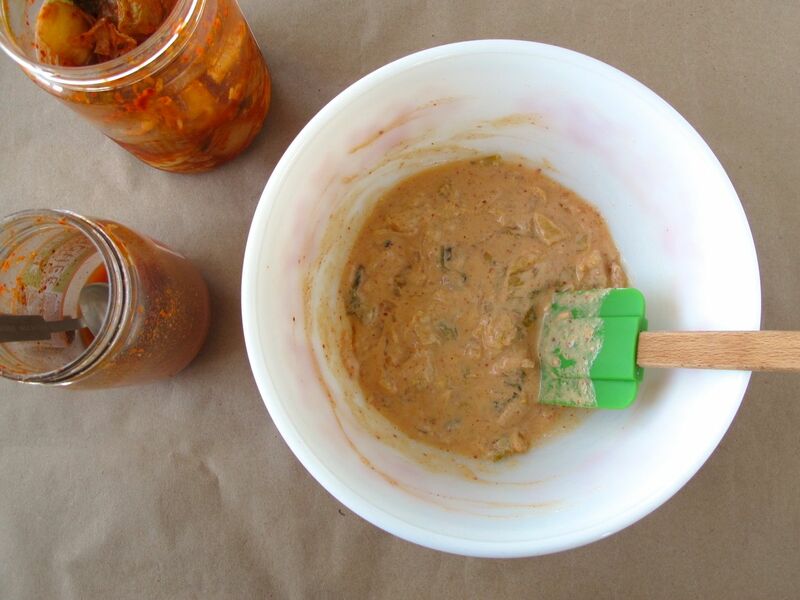 Then combine the kimchijeon ingredients in a medium bowl: whisk together flour, sugar, and salt, then use a rubber spatula to stir in the diced kimchi, water, and kimchi liquid, adding another spoonful or two of kimchi liquid or water to thin the batter more if necessary. 4. Test the temperature of your pan with a tiny drop of the batter — it should sizzle. Spread the oil around evenly by tilting the pan (or with a bit of paper towel held between chopsticks). Then quickly pour in and spread out the batter (or only half the batter, if you doubled the recipe). It will start cooking and firming up immediately so spread it out right away with a rubber spatula. 5. Fry for 2-3 minutes on each side (or longer for slightly thicker pancakes, but use a spatula to start checking the bottom for too much browning after the first 2-3 minutes). You can add more oil to the pan under the second side if desired, but I usually don’t bother with that. Flip the pancake back over and fry on each side for another minute or two, until it looks lightly browned and crispy. Then transfer to a plate, nicer side up. 6. Use scissors to cut into squares or rectangles. Serve warm with dipping sauce. I am going to have to try this. It looks delicious! Awesome — so glad to hear you plan to try this. Hope you enjoy it! Sounds like a busy few weeks – good luck with everything!! 1. good luck on your dissertation presentation and defense. Never heard of Kimchi, thanks for sharing the recipe! Have a good two weeks off. 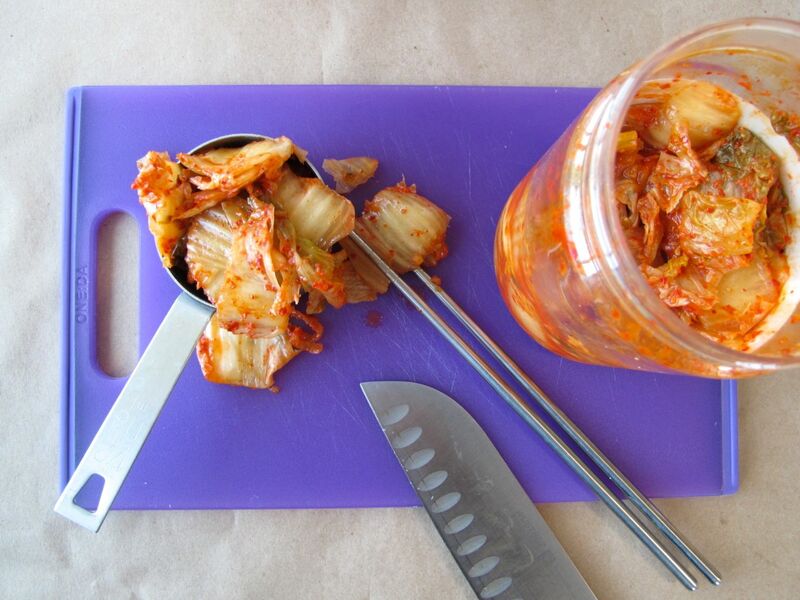 mmmm loving Kimchi at the moment this looks like a great way to enjoy it. Thanks so much! 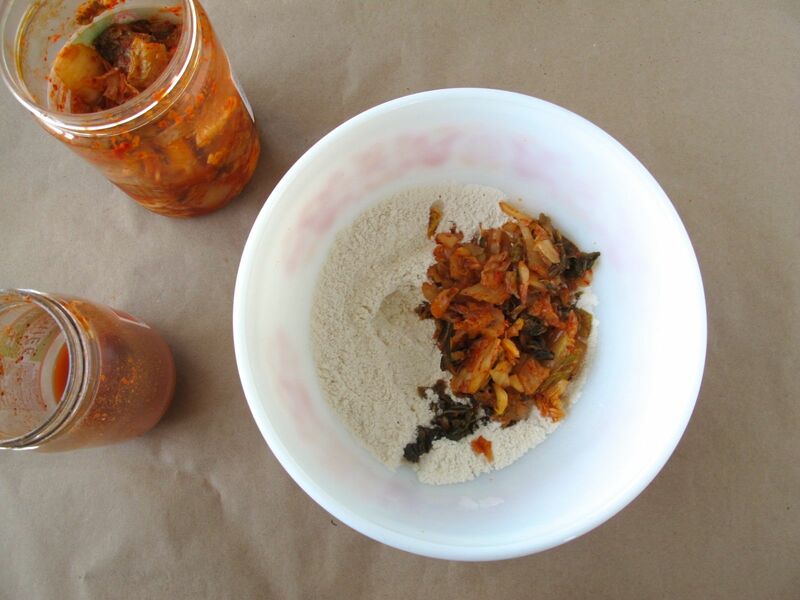 :) And yes this is a great way to enjoy kimchi, especially kimchi that’s fermented past its prime… (although I also use newly-purchased kimchi for it!). I just figured out tonight’s dinner – YUM. Good luck and congrats on your dissertation! 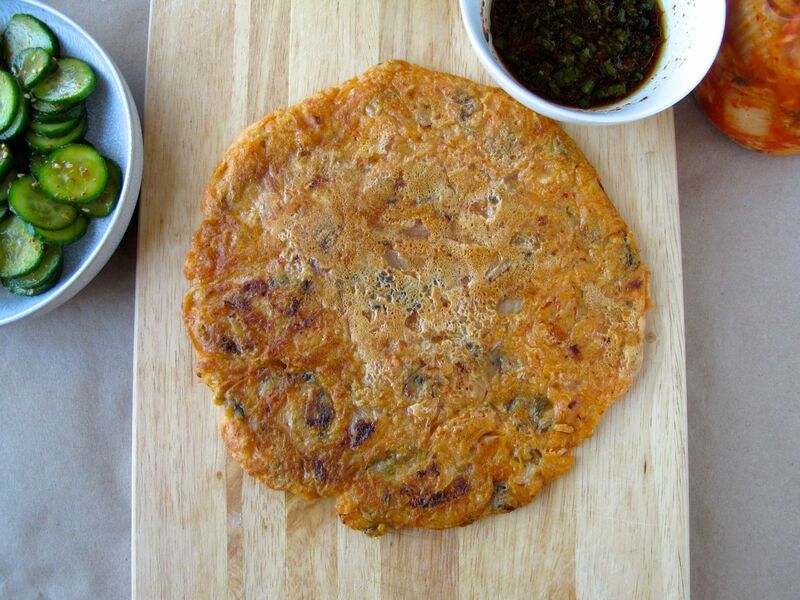 I love scallion pancakes and kimchi. Another wonderful recipe! This looks amazing. I can’t wait to try it. I love Korean style pancakes! A restaurant near me does a seafood one that was big enough to feed me for 3 days. That was the fishiest weekend of my life. Oh my god, that sounds awesome. 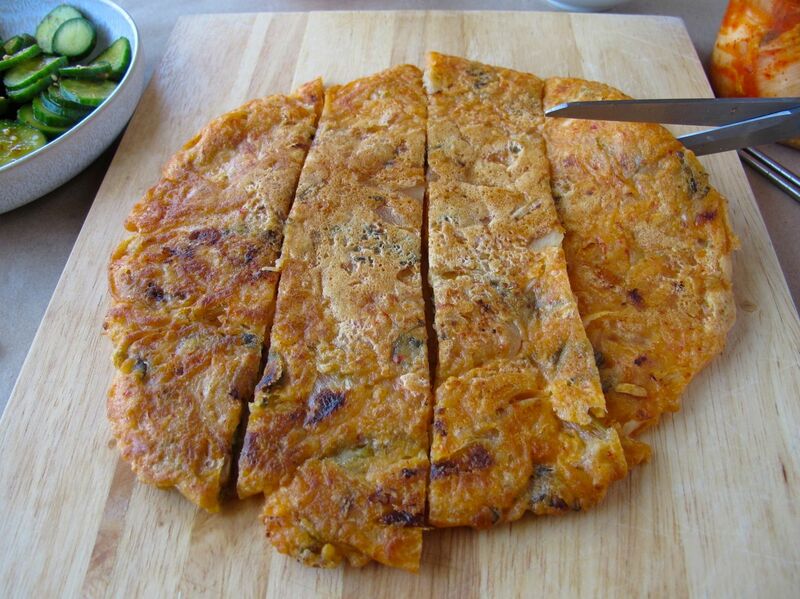 I’ve also nearly been done in by the size of some of the seafood/scallion Korean pancakes (haemul pajeon) in Seoul — I definitely went to a restaurant by myself once and ordered one as a snack, thinking it would be appetizer-sized, but I think I ate the equivalent of 2 full meals before I gave up and couldn’t finish it! Yay! I have been anticipating this recipe since you mentioned it. Now there is clearly a reason for me to go out and get a jar of kimchi for the fridge. Plus that’s a good excuse to go to K-town and eat at my favorite Korean buffet/take-away place. Where I failed at soon du bu, hopefully your recipe will help me succeed at jeon. I assume essentially the same theory for pajeon? Yay! I hope you like it. 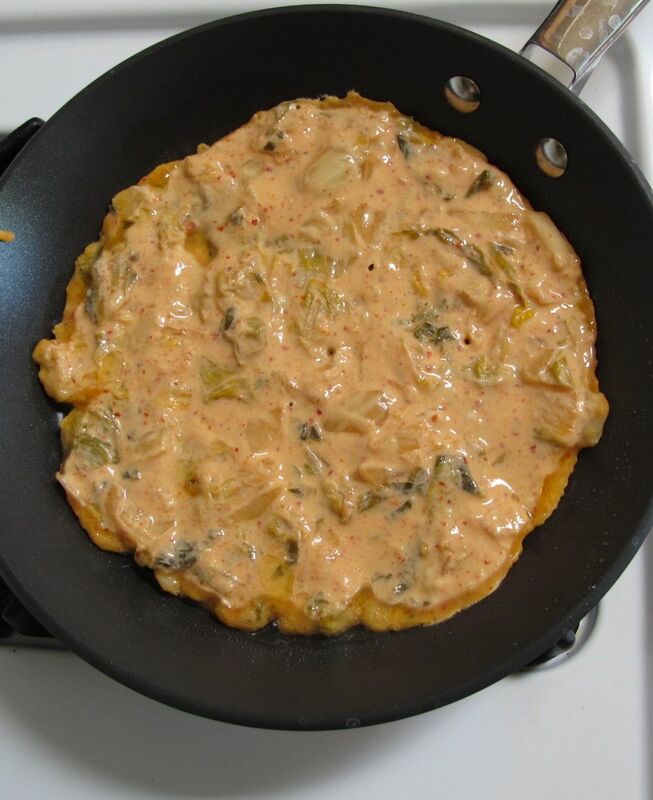 And yeah, I mean most pajeon can also be made with just flour/water (or you can add an egg), but kimchijeon is a little different, because the kimchi adds so much bulk to the pancake. I haven’t perfected a pajeon recipe to have any super knowledgeable tips on this (mostly because Paula would NOT eat that much scallion!) 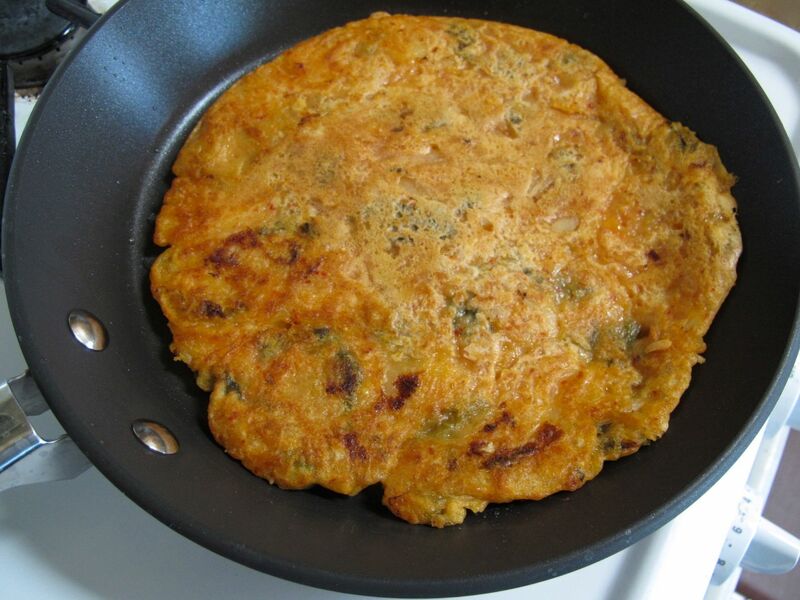 but I’d say you’d definitely want to increase the amount of batter for pajeon, and also pour it into the hot pan first and *then* drop the scallions / sliced chili pepper / whatever into the pancake while the first side is cooking, rather than mixing the ingredients into the batter in advance the way kimchijeon is made. So I just bought kimchi expressly to make this dish (ok, I also made some korean marinated chicken on the new! grill). Also, what if I add CSA scallions to this recipe, but like, not full on pajeon? I’ll notify you of the results :) Jordan’s cat keeps eating the garlic chives I’m trying to grow on the pattio, but someday maybe they’ll survive long enough that I’ll be begging for more korean recipes! Thank you, thank you, and thank you! :) I guess I will enjoy the time off from blogging (especially the dealing-with-photos part), and I’ll definitely enjoy my sister’s wedding, but really I just want the next two weeks to be overwith!! I love this idea! Sounds amazing! Oh my goodness, I love scallion pancakes and this is just a whole new level of awesome. WANT. I know it’s going to feel amazing to be done… after all, I’ve had the guilt from *not* working on it hanging around for years now! This looks great – my husband LOVES Kimchi and would be so excited if I made this, thanks for sharing the recipe! Thanks, Sarah! I hope you and your husband both enjoy this! This is going to be breakfast tomorrow! I got a little heavy handed with the spice when I made my last batch of kimchi and while it tastes good, it’s somewhat painful to eat! Glad to have a use for it in these pancakes. Also, going to put a runny egg on top. YUM. Good luck on your dissertation, and enjoy our fair state! Yummm, it has never once occurred to me to have this for breakfast, OR to top it with an egg, but those are both genius ideas! I hope you enjoyed it! It looks so yummy. Good luck with your dissertation! I’m also writing a dissertation for my PhD and I envy you because you’re almost at the last stage. ^^ I hope that you can defend well. I can only imagine its wonderful flavours! Thank you!! :) And yes, I definitely plan to — it will be a nice little break for me before my diss. defense! Wow, I love this simple recipe idea! It looks very interesting! Good luck with your defense and everything! Thank you! 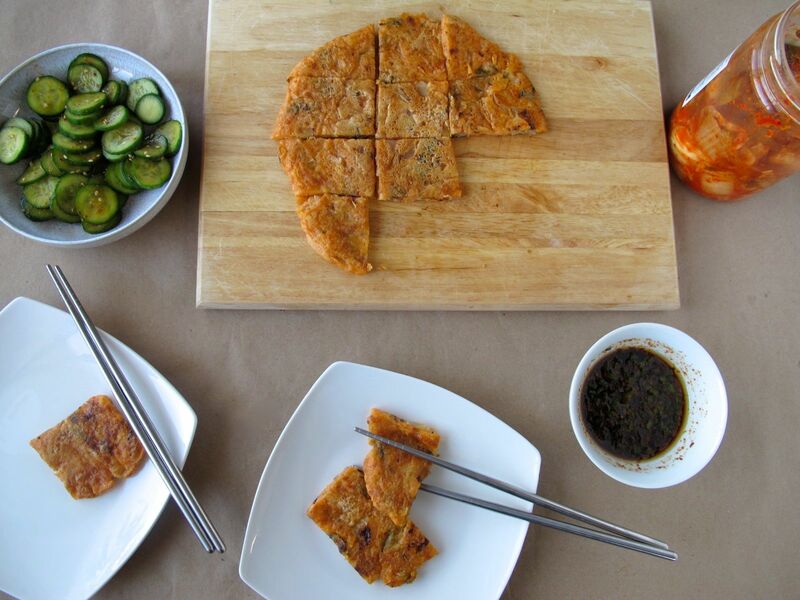 Yes, it’s a very simple, basic Korean recipe, but definitely one of my favorites! AHHHHHH this looks amazing, Allison!!! Bowl #2 is on the bindaetteok side of the kimchi pancake divide, but always says that no one’s bindaetteok will ever match up to his grandmother’s fabled version. Maybe I’ll just surrender and defect to the kimchijeon side instead of trying fruitlessly to recreate her legendary pancakes ;) Because these look amaaaazing. Good luck with the final steps of your dissertation, and enjoy the wedding!!! And thank you!! Can’t wait to be done with this 7-year PhD! And I’m even more excited about the big family reunion that my sister’s wedding weekend will be. 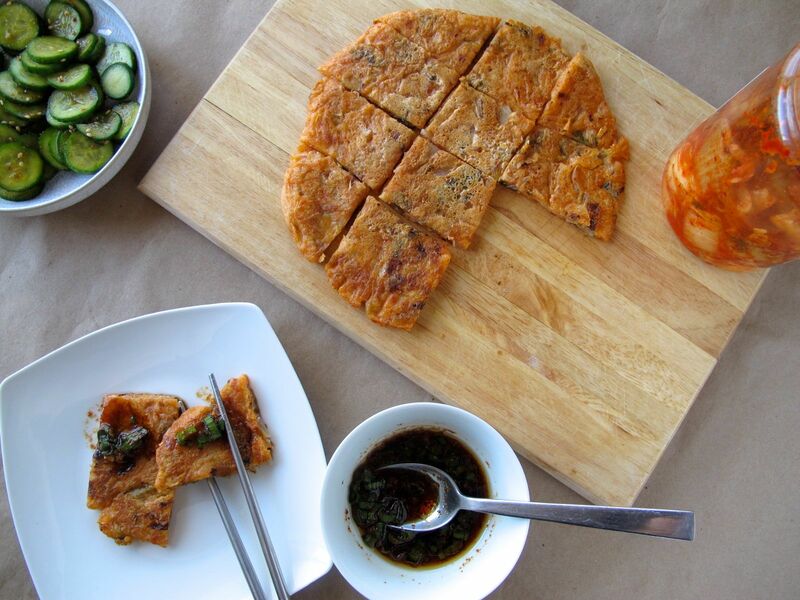 Fabulous way to use kimchi! I love kimchi and have tasted it “cooked” Looking forward to seeing you return and enjoy the wedding! Oh man, you have to try it cooked, especially if you already love it raw! Definitely try it in kimchi fried rice sometime, too! What I meant to say is I have NOT tasted it cooked. Geez. I retract the previous comment and insert the phrase “original to a boring American like me” who is always trying to learn more. Thanks for being a great teacher! 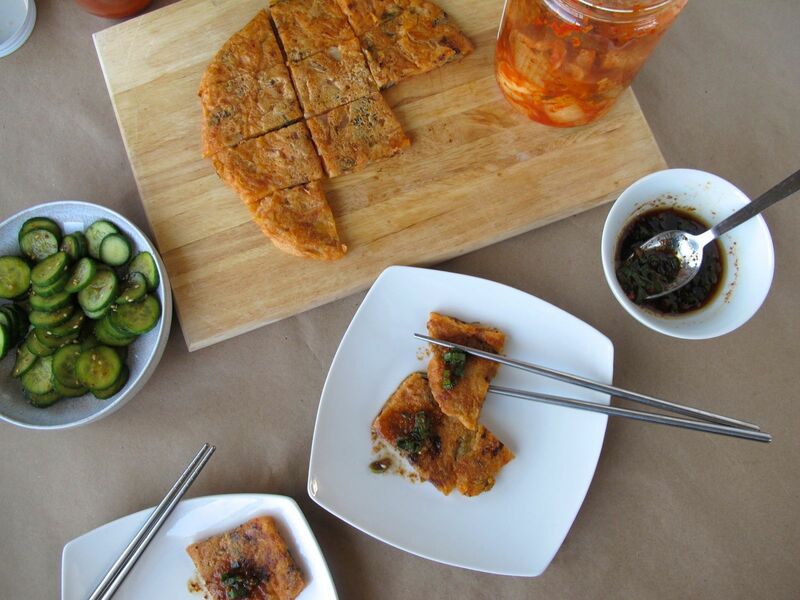 :-) I recently discovered both kimchi and miso and have fallen in love with fermentation. Beautiful photos and recipe, Allison. Haha, yeah I figured that’s what you meant, but I just wanted to make it clear that in no way was I taking credit for coming up with this dish… I have also gotten more into all things fermented recently. Have you read “Cooked” by Michael Pollan? I absolutely LOVED that book, and 1/4 of it is about fermentation, so you might enjoy reading it! 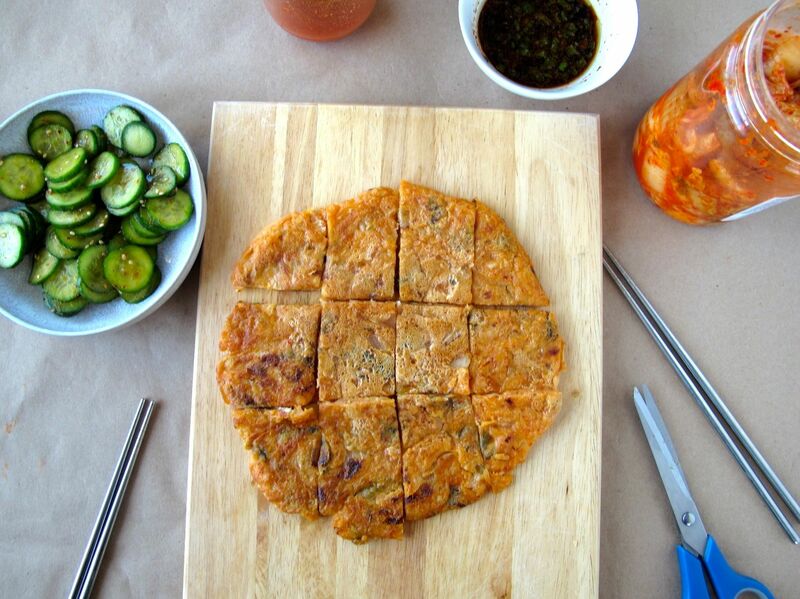 I looooove kimchi pancake and I’ve never created it from scratch, I always cheated using the packaged mix, but I will be making this! Thanks! Yeah, I know, I have used packaged mixes for this before too, and honestly that’s why I was experimenting with mixing in different types of flour, since the mixes always have at least 3 different kinds in a blend… (I have one mix of jeon batter that even includes dotorigaru — acorn flour!) but when making it from scratch, it actually turned out the best when I used only all-purpose flour! Sounds like you are going to be super busy my friend! I am sure it will all go smoothly! 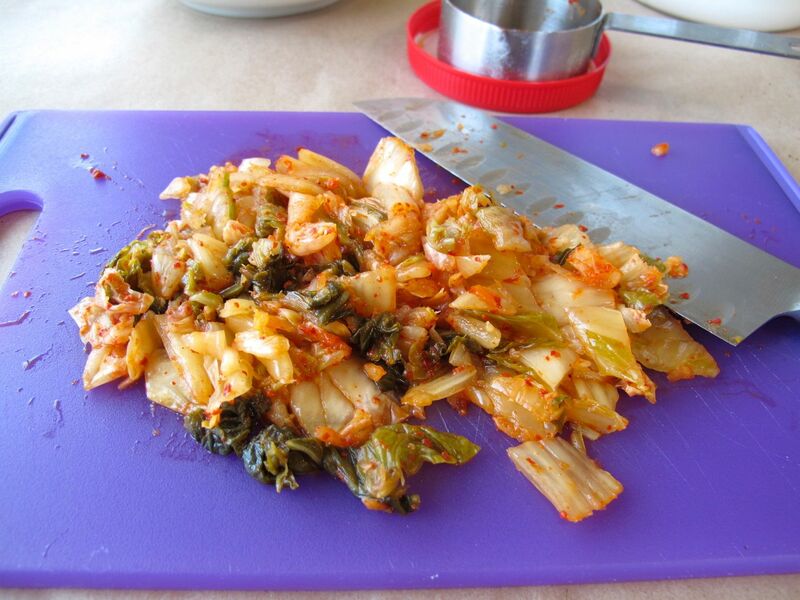 I’ve never made this myself, but now I will because do I enjoy kimchi:) good luck with your dissertation defense! What? You really have not missed a post until now! Wow! Well, I have been horrible lately. I just got back from a little trip and I have not even seen a computer for days and days! Although I love love love to travel it is great to be back home, sit on my sofa and visit my favourite blogs :-) And (as always) you have cooked some amazing food! Wow! Yep, it was pretty crazy how dedicated I remained to this blog despite entire weeks of slacking off in the dissertation department. But I think it helped get me through grad school! This is such a unique idea!! I love kimchi and I love pancakes!! Together = bliss! Tolle Fotos,Tolle Rezepte, ich werde immer wieder schauen und auch verschiedenes kochen.